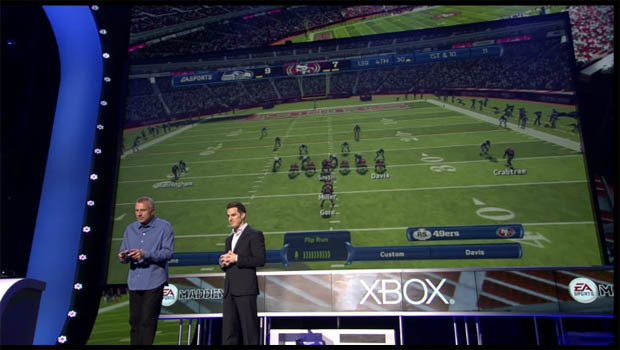 Madden fans, prepare yourselves: as revealed at Microsoft's E3 press conference, Madden NFL 13 will be gaining Kinect voice controls that allow you to call plays on the line of scrimmage. Demoed onstage with Hall of Fame quarterback Joe Montana, the controls allow you to not only audible into new plays, but select individual players via voice commands to change pass routes, shift them on the line, and more. Definitely seems like an improvement over the button-pressing menus from past Madden titles. Madden 13 with the new Kinect controls hits stores on August 28.